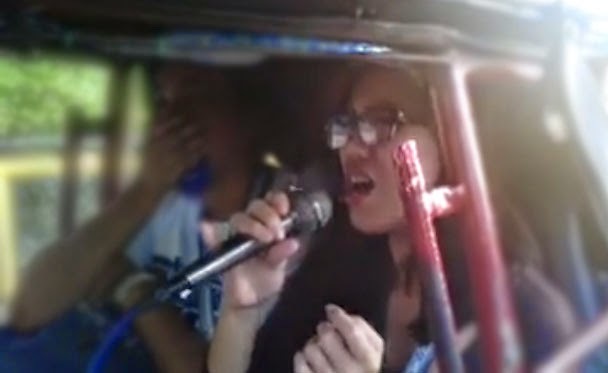 Coleen Faye Lopez a.k.a Tricycle Videoke Queen became the newest singing sensation after a video that shows her belting out "Forever's Not Enough" went viral. The former wedding singer, who lives in Subic, Zambales and is taking up Education at New Era University, agreed to the request of the driver of the popular tricyle with free Wi-Fi to sing the Sarah G. hit. When the Hayop Sa Galing Facebook page posted the video, netizens expressed admiration and praised Coleen for performing the song without much effort while sitting. Post by Hayop Sa Galing. On Facebook alone, the viral video got tens of thousands of shares and over half-a-million views since it was uploaded last February 16. She already guested in a morning show aired on cable network Net 25. Many of her new fans, however, said they wanted the Tricycle Videoke Queen to be featured on GMA-7's Kapuso Mo Jessica Soho for more exposure. Despite her rising popularity, Coleen posted on FB this morning that she is putting God above everything. The teen singer is a member of the Iglesia Ni Cristo (INC).